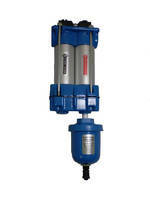 The 5 Micron Compressed Air Filter provides point of use filtration of liquids, oils, and other contaminants. According to Walmec North America, this two-stage filter is designed to operate most effectively when placed near the point of use. It has a 5 micron rating, and is available in sizes with flow ranges of 15 SCFM to 250 SCFM, and pressure ratings of up to 250 PSI. The 5 Micron Compressed Air Filter is ideal for a large variety of applications including surface preparation, paint spraying, powder coating, air powered tools, and pneumatically operated equipment. The first stage filter knocks out all liquids, and particles of dirt, dust, rust, and scale. The second stage filter removes remaining moisture, contaminants, and particles down to 5 microns. An automatic float drain under the second stage filter opens and expels all collected liquids when an ounce or more is present. It is fully automatic with no continuous air loss. The 5 Micron Compressed Air Filter has a permanently mounted differential pressure gauge and comes with mounting brackets. The differential pressure gauge provides a visual indication of required maintenance which is easily done by installing the appropriate service kit. No need to remove the unit from the compressed air system. An optional pressure regulator with gauge is available. Walmec North America understands the importance of protecting your valuable machinery, tools, and finished products from wet, dirty, and contaminated air. The 5 Micron Compressed Air Filter effectively achieves this. It is easy to install, use, and maintain.